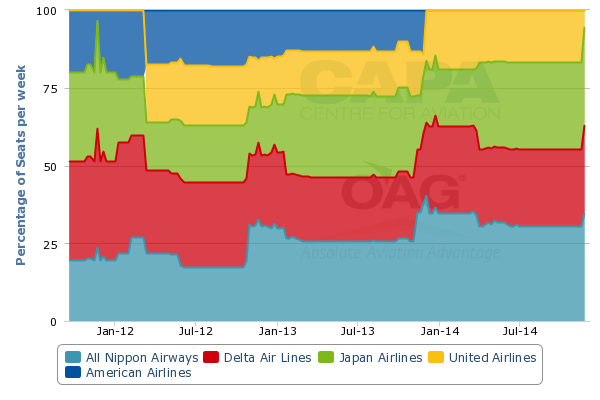 This is the second part of CAPA's look at Japan's third largest airline. Skymark Airlines is one of a handful of low-cost carriers that has or plans to launch long-haul operations. But in this area history is not kind. Then-Virgin Blue's unfortunately timed launch of long-haul unit V Australia ran into severe and costly headwinds. Norwegian Air Shuttle and Cebu Pacific suffered profit falls after commencing long-haul flights. The problems involved in launching long-haul flights has made WestJet hesitate. Although Japan's Skymark has posted its first loss in five years, it has previously been successful as Japan's third-largest domestic airline. But short-haul success does not guarantee long-haul prosperity. Skymark must make significant changes if it is to support an A380 operation. Partnerships, interlines, codeshares and loyalty programmes will need to be established. SkyTeam's Delta Air Lines, lacking a Japanese partner seems a likely prospect, but developments appear limited. Skymark may also need to re-consider its launch destination of New York. It is now too late for Skymark to implement all of these changes in time for a stable A380 launch in Dec-2014 as it last planned. Skymark needs to consider delaying its A380s or contemplate whether it can endure – and survive – what will likely be significant losses. Skymark is a domestic carrier with international experience confined to limited charter flights to beach destinations. Such charters see almost entirely Japanese passengers on package bookings, eliminating much marketing and distribution work for Skymark. Skymark, should it realise its A380 aspirations, would undertake one of the riskiest of international expansion plans. Not only would Skymark be going international, it would do so in a very distant market with the world's largest passenger aircraft in an unprecedented configuration of premium economy and business class only. It would also be Skymark's first time operating the A380, and the first time the aircraft is offered by a Japanese airline. Skymark will also have limited Airbus and widebody experience as its A330 operation is only due to launch on 14-Jun-2014. Long-haul services were enough of a start-up challenge to Norwegian Air Shuttle and V Australia, which already had international experience and were internationally-minded companies. Even now ANA and JAL struggle with relevant international marketing, having been able to rely on heavy oubound bookings in the past. As Japan's O&D market changes shape, Skymark will be unable to ignore inbound potential from foreign markets. And then there are the financial implications. V Australia lost AUD64 million (USD51 million) in the first four months of its operation (through 30-Jun-2009). Including start-up costs, V Australia's loss was AUD124 million (USD99 million) across the period. V Australia has parallels to Skymark: Australia-US previously had high fares like Japan-US, and V Australia had limited feed at its destination in Los Angeles. V Australia had an Australian and New Zealand market to pull traffic from, but even offering unprofitable fares had a load factor of only 71% in its first year across the Pacific compared to Qantas' 79%. Skymark enters with less domestic feed and no connections at all on the either end. In both markets point-to-point traffic is only about half of the total. Norwegian Air Shuttle after launching long-haul flights reported a 30% decrease in profits due to factors including its long-haul start-up costs and wet-leasing aircraft for when its 787s went out of service. A specific figure for long-haul costs was not supplied. See related report: Norwegian Air Shuttle’s 2013 profit falls. Not yet low-cost enough? Cebu Pacific reported a very modest 36% load factor in its first month of flying long-haul from Manila to Dubai. While Cebu's long-haul operation has improved (without specific figures provided either), Cebu's profit is declining year-on-year. In entering the Tokyo-New York market, Skymark would compete with two anti-trust immunised joint-ventures: one between American Airlines and Japan Airlines, and the other between All Nippon Airways and United Airlines. The two JVs account for 62% of seat capacity between Japan and the United States in Jun-2014, although this figure is understated as it includes Japan-Hawaii services that Skymark would not be competing with. Between Tokyo and New York (including JFK and Newark), the two JVs account for 76% of seat capacity. It is true that fares from Japan to the US are high, but Skymark faces challenges to stimulate traffic and even compete with ANA and JAL. Skymark has no partners so far and limited feed, making it largely dependent on selling the local Tokyo-New York market. Japan's fliers are heavily loyal to ANA or JAL yet Skymark has no loyalty programme of its own, further reducing its attractiveness. 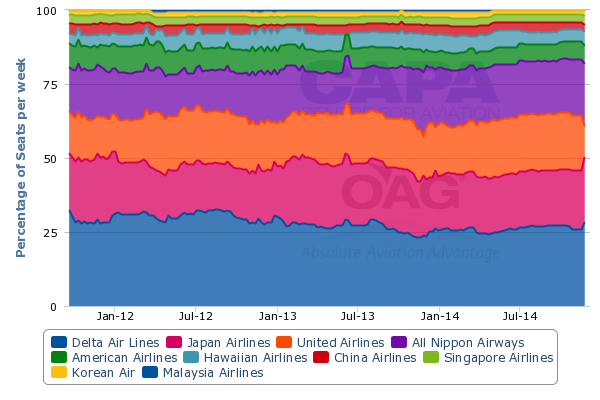 The JVs meanwhile give the airlines great strength, options, scale and visibility across markets. Skymark will lack these characteristics. In another example of an airline launching a long-haul network, Hainan Airlines in the past year has greatly expanded its long-haul North American network. However, Hainan has done so with the backing of a large domestic market that it can use to facilitate connections (unlike Skymark) and has entered markets with its 787-8, which seats 213. This is a conservative effort: Hainan's 213 seats on its Beijing-Chicago flight compare to the approximately 275 offered by American Airlines and United on the route. Skymark in contrast will take the opposite approach: its A380 will seat 394 passengers, more than the 186-250 or so seats (this varies by aircraft) ANA and JAL offer on each flight to New York. 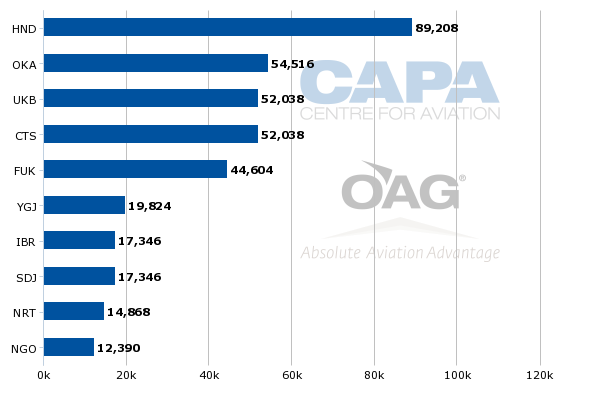 Point-to-point traffic is estimated to comprise 52% of each ANA and JAL's Tokyo-New York flights in the year to Mar-2014, according to OAG Traffic Analyser. Connections beyond Tokyo are larger than connections beyond New York. 36% of JAL's traffic connected in Tokyo while for ANA it is 46%. Osaka provides the largest feed for ANA and JAL, with approximately 51 passengers a day taking the two carriers from Osaka to New York JFK. However, Skymark does not serve Osaka from Tokyo Narita. From Narita, Skymark in Jun-2014 only serves Sapporo, Okinawa and Yonago. Sapporo and Okinawa are much smaller markets, with ANA and JAL seeing about seven passengers a day travel between Sapporo and New York. For Okinawa, it is only about four passengers. Both Chengdu and Jakarta are larger markets to New York via Tokyo than Okinawa is. Likewise Jakarta, Guangzhou, Singapore and a number of other cities are larger markets to New York via Tokyo than Sapporo. Skymark could try to reach the Osaka-New York market via its Tokyo Haneda flights to Kobe, but Kobe airport will be inconvenient for many in the Kansai area, and would require a transfer between Haneda and Narita airports. ANA and JAL offer flights from convenient downtown airport Osaka Itami to Tokyo Narita, eliminating the need for a lengthy and expensive airport switch in Tokyo. It is a similar story for Fukuoka, ANA and JAL's second-largest overall source market for New York flights. Skymark serves Fukuoka from Tokyo Haneda. But Skymark does not serve the third-largest domestic source market, Nagoya. And in any event Nagoya is estimated to have smaller traffic volumes than Ho Chi Minh or Manila. Further, Skymark's Tokyo Narita operation has an uncertain future as the carrier has cut service from Narita in response to drastic unprofitability that led it to report its first annual loss in five years. At best, Skymark is heavily disadvantaged in feeding its New York flights. It does not offer connections at Tokyo Narita to the main Japanese source markets, and has no international flights or partners to reach the numerous Asian cities that provide important traffic volumes. Access could potentially be secured to a handful of Asian cities via partnerships, but these could be limited as other carriers either fly long-haul on their own (such as Philippine Airlines) or have partners (Garuda Indonesia working with Delta in Tokyo). And then there would be details about interline or codeshare rates as well as schedule synchronisation. This is all provided of course that Skymark elects to partner and has the IT to support even full interline agreements. Skymark has a significantly larger operation at Tokyo Haneda than Tokyo Narita, causing some to wonder if Skymark should move its A380 operation to Haneda, Skymark's largest hub. But offering long-haul flights from Haneda could actually be disadvantageous. Skymark would only have access to late night/early morning slots at Haneda. Even if Skymark had international daytime slots, Haneda prohibits daytime A380 movements. American Airlines offered Tokyo Haneda-New York service with these slots and found the service unsustainable. American departed Tokyo at 06:50, which did not provide same-day connections in Tokyo. That early departure time also created access issues as Tokyo's public transport does not run 24 hours a day and taxis can be expensive. The arrival time in New York around 05:30 the same day provided onwards connections. Likewise American's return service departed New York around 19:00, enabling same-day connections in North America. However, the 22:15 arrival time back in Tokyo Haneda stymied connections and once again created airport access challenges. Switching the slots to have an evening departure from Tokyo and morning arrival back would enable connections and airport access in Tokyo, but would no longer permit connections in New York. Although connecting traffic from Tokyo is larger than beyond New York for ANA and JAL, Skymark would likely not be able to ignore onward connections, especially since it would likely be challenged gaining feed in Tokyo. Skymark would likely have an easier time securing international feed at Narita rather than Haneda. Narita sees more service than Haneda to key Asian points. Further, airlines tend to price Haneda flights at a premium over Narita given Haneda's convenient location. This could increase the cost of interline and codeshare flights for Skymark. Skymark needs partners and could look at various carriers providing feed into Tokyo or from New York (such as JetBlue). But a cornerstone partnership with Delta Air Lines would change its fortunes the most. Delta operates alone across the Pacific, having failed to woo JAL from oneworld to SkyTeam while JAL went through bankruptcy restructuring. Delta has considered a deeper partnership with Korean Air, but nothing has eventuated (and the mood now between them is more contentious as Delta expands with its own metal). Delta appears to be warm to the idea of working with Skymark, but Skymark's limited IT system means it cannot even fully interline. Skymark's lack of economy class and large premium economy class could make the product difficult to distribute. Either Skymark's premium economy seats would not be visible to those searching for economy fares, or Skymark would have to list its premium economy seats in an economy fare bucket. That could require discounting the seat to compete with other carriers' economy seats, or charging a premium and hope the market will understand the greater value Skymark provides – but this is unlikely to occur. Japan's largest travel agency, H.I.S., owns part of Skymark and could help to sell the product. But recent changes in the personal Skymark-H.I.S. relationship may mean H.I.S. is no longer as willing to help Skymark as it once was, according to local sources. Even if H.I.S. offers help, Skymark would still have feed and connecting challenges. Further, H.I.S. is stronger in the leisure market than the business market, at which the airline's configuration is targetted. Skymark's A380 will have 280 premium economy seats on the lower deck and 114 business class seats on the upper deck, so Skymark cannot ignore the premium market. Here Skymark's limited network and lack of a loyalty programme, it would enter with a disadvantage. Skymark's domestic 737 operation is all economy, meaning Skymark faces a learning and marketing curve to introduce premium service. While its A330s will be in an all-premium economy configuration, service will still be limited and Skymark will have limited experience with this type prior to taking A380s. Skymark will have the lowest-density A380. Its 280 premium economy seats on the entire lower deck compare to Lufthansa having 420 economy seats on the entire lower deck of its A380. Business class is high-density, with Korean Air for example having 94 business class seats on the entire upper deck of its A380. The low density means Skymark will need to pursue yields in the absence of volume, but is unclear Skymark can secure a sustainable pool of passengers. Skymark offers a lower CASK than ANA or JAL in the domestic market, but Skymark's long-haul CASK is unclear, and even then may have enough disadvantages that low fares will not be enough to woo passengers in the less price sensitive business travel market. Skymark had planned London as its first destination but switched it to New York, citing more favourable conditions. However, with London showing signs of recovery and Europe some growth signs, Skymark still has time to re-evaluate the New York route as its first destination. Paris, likely Skymark's only other viable point in Europe, generates about 50% local traffic between Tokyo and Paris on ANA and JAL, similar to New York. But a key difference is that most of the connecting traffic from Asia to Tokyo is from domestic Japanese cities and not international Asian cities. This would be a plus to Skymark, although it would still need to address a Haneda-Narita transfer issue. Competition is arguably less intense: while ANA and JAL participate in joint-ventures between Japan and Europe, none of the JV hubs are in Paris. JAL partners with British Airways in London and Finnair in Helsinki while ANA partners with the Lufthansa Group of airlines, which do not have hubs in Paris. London is a smaller market but with a higher share of point-to-point traffic (around 59% for ANA and JAL). As with Paris, the Tokyo flight is fed mainly by domestic Japanese cities, not international Asian cities. There could be room for more stimulation in the London market, although Skymark would be taking BA and JAL head-on. Skymark would also need to pay for London Heathrow slots (if a good pair can be acquired) or decide if operating to an alternative London airport is viable – which most Asian carriers have found not to be the case. Although Skymark's planned A380 launch in Dec-2014 is still about six months away, Skymark has too much to do in too short a time to prepare for a possibly sustainable launch. Further, Skymark does not have the management bandwidth to solely focus on the A380 project. The airline simply has too many issues on its plate at the moment: it simultaneously has to prepare for the entry into service and roll out of its A330 while also addressing unprofitability in its domestic heartland. Skymark's options are not enviable. It must either delay its A380 operation to make strategic changes, or accept significantly high losses for a fairly extended period. The first option requires swallowing a bitter but inexpensive pill immediately, while the latter means a much more expensive pill later. This is an unfortunate scenario for Skymark, which has achieved – prior to its recent loss – genuine success in the Japanese market. Skymark has also helped balance ANA and JAL. Skymark's A330 project is of markedly different strategy and prospects than its A380 concept. One prospect is to secure a workable partnership with Delta; Skymark would however enter negotiations from a position of weakness and Delta would in any event be cautious about being too obviously involved in what might be an unsuccessful venture. So, although there are potential upsides for both, a hasty marriage is unlikely. Long-haul services with the largest passenger aircraft in the industry's least-dense configuration may reflect glamour, but there is little pride to be gained in making heavy losses. Skymark has found success in the demanding and complicated Japanese domestic market. Its challenge now is to restore focus on areas where its strength lie.